Sometimes, all The Legal Genealogist wants to do is point a finger at someone else. Particularly when deadlines are looming on all sides and time is something that’s in unusually short supply. That’s when I really enjoy having the opportunity to point a finger to send readers off to read something else. And today I am sitting here giggling while sending you off to read someone else’s blog post. Because — if you’ve spent more than a nanosecond on genealogical research — it’s one of the funniest posts you’ll come across… and boy, does it ever ring true. As you can see from the posting date,2 this isn’t a recent post — it was first published more than two years ago — but it’s timelessly funny. And that can be said of much that Kerry Scott writes — it is funny, even when her end point is deadly serious, and it is timeless. So while I go off to try to meet deadlines, you can go off into gales of laughter. And while you’re there, don’t forget to “Get More Stuff Like This” — read Clue Wagon. You won’t regret it. Thank you! Thank you! Thank you! As someone who’s done the Andersens in Copenhagen needles in a haystack search and is the proud owner of a tree with multiple variations of Niels Hansen who begat Hans Nielsen who begat Niels Hansen, I most certainly can identify. 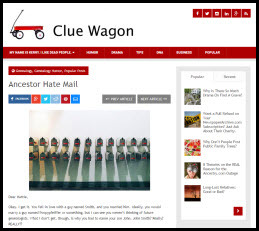 Thanks for pointing us in the direction of The Clue Wagon. Up until now I thought I was the only person who got motion sick when using microfilm. This will be a great new (to me) blog to follow! Kerry’s blog is always fabulous! I added a few more hate-mails of my own in my head as I read comment after comment, as well. And – OF COURSE, I read all the footnotes to your blog, Judy. They are a ‘must-read’ part of your blog! Cheers.